This beginners tutorial talks you through how to write python programs for a micro:bit that can respond when you press a button or touch one of the input pins along the bottom of the device. 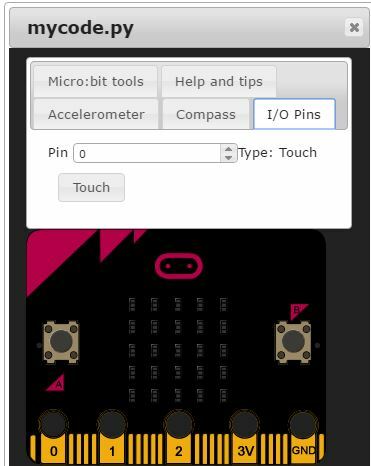 The code below turns a micro:bit into a counter: press button A to count down, button B to count up and touch pin 0 to reset back to 0. Try it out and then read through how it works. You could use this to keep score in a competition, especially if you use two or more micro:bits – one for each team. The variable counteris used to store the number that is displayed on the micro:bit at any given time. The variable new_valueis used to detect if the number has changed so that the new number can be scrolled on the screen. Lines 9 makes all of the lines that are indented underneath it (lines 10-33) repeat forever. You can see on line 12 and 16 how to check if a button has been pressed. There are two ways of doing this: button_a.is_pressed()checks to see if the button is currently being pressed at that exact moment in time whereas button_a.was_pressed()checks to see if the button has been pressed at all since last time you checked (or since the program started). Digital pins: You can input (sense) if they’re turned on / off, or output (send) an on / off signal to them. Touch pins: These are the easiest to use – they can detect the change in capacitance that happens when a human finger touches them so you can use them as touch sensors. Pins 0, 1 and 2 can be used as touch pins. These are the larger, numbered pins along the bottom of a micro:bit. Lines 23-25 stop the counter value from going below 0 if you keep pressing button a. Lines 28-30 might take some explaining: if new_value != counter: checks to see if the new_valueis not equal to counter , which will happen if you’ve just pressed one of the buttons. display.scroll(...)expects its parameter (the value in brackets) to be a string (which is one or more letters / digits / characters). counter is an integer (whole number) rather than a string so str(counter)converts the integer into a string so it’ll work with display.scrollproperly. sleep(50) on line 33 isn’t necessary but it’s a good idea to have it. If you didn’t and you tried to test the code in the simulator, your browser will crash. Testing it on a micro:bit would work but it’d use more battery power than necessary. In both cases, the problems are caused by the while loop repeating so quickly that the CPU is always busy. sleep(50) just pauses the program for 50ms, which isn’t long, but long enough for your browser / micro:bit to have a breather.